Hue/Saturation Channels is a utilitarian filter intended to assist in the selection or masking process. • Unlike hue, which wraps around a starting point, hue difference prevents the splitting of closely-spaced hues into black and white. 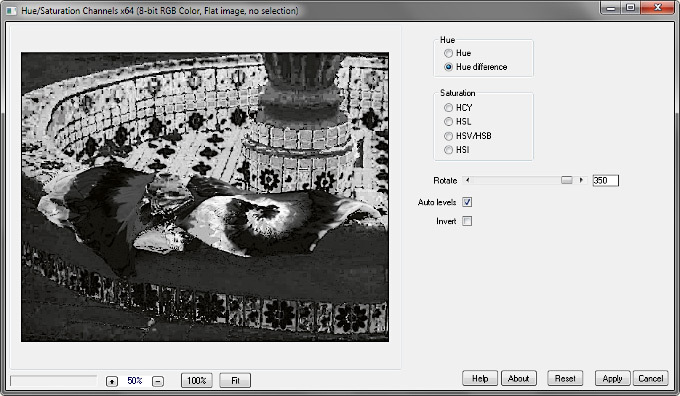 • Rotate rotates the hues, and moves the point from which hue and saturation difference are calculated. This can help isolate certain hues, or areas of intermediate saturation. • Auto levels is applied by default to maximize the value separation. HueSaturationChannels_x64.zip version 1.2, 406 KB, 64-bit applications. HueSaturationChannels.zip version 1.2, 401 KB, 32-bit applications, Windows 32 or 64 bit.